Springfield Primary School is based in Tilehurst, Reading. 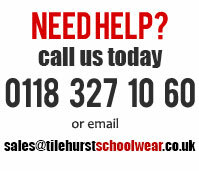 The following items are available from Tilehurst Schoolwear here with Click & Collect available from our shop in Hildens Drive, Tilehurst. Sweatshirts, Cardigans, Polo Shirts PE T-Shirts, Book Bags, PE Bags, Gymsacs, PE Shorts which have all been embroidered with the Springfield logo. Backpacks, book bags, PE Bags and more are also available blank.